The Var region is blessed with high sunshine hours and scenic coastline showcasing outstanding beaches, beautiful islands, seafront resort towns and busy marinas. One of the best ways to get the most out of the region is to combine your land-based accommodation with a stay on a private yacht where you will quickly realise that all luxury yacht charter guests are spoiled by magnificent ocean vistas and ample anchorages to watch sunsets from on board. For those days ashore there are plenty of land-based activities to satisfy all interests including hiking, casinos, wine tasting, cycling, shopping and visits to quaint villages, museums or historical sites. Fréjus was historically a Roman settlement that became a vital naval base under Augustus, second only to Marseille in importance. The sands of time have shifted and this popular resort’s attractions today include a Roman amphithéâtre, zoological park, a long sandy beach fringed by restaurants and nearby wineries like Clos des Roses. 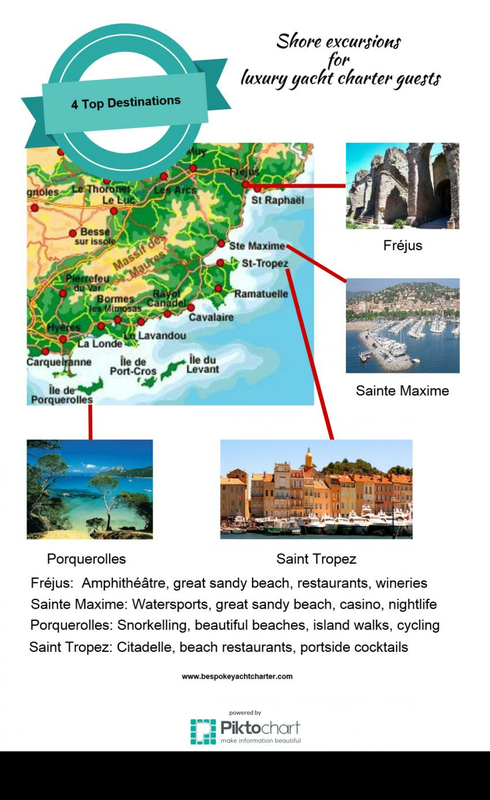 A popular family resort, Sainte Maxime lacks the glamour of nearby Saint Tropez but it draws enough visitors for strolling along the palm-lined promenade, water sports, trying their luck at the casino and sampling the nightlife. Located near to Hyères and Bormes-les-Mimosas (two mainland towns worthy of day trips), the Íles de Porquerolles are a sublime place for stepping ashore. Discover breath-taking beaches, cycle tracks past olive groves and cliffside walking trails with views of rocky coves dotted with nests of seabirds. Overlooked by the 16th-century Citadelle, Saint Tropez combines celebrity, extravagance and authenticity resulting in one of the busiest resorts in the region. Stop by the Musée de L’Annonciade for art collections, head to one of the beach restaurants sprawling along Plage de Pampelonne or park up with a seafood platter, cocktail and slice of Tarte Tropezienne at one of the many restaurants facing the port. Other nearby towns to visit include the medieval village of Gassin and Port Grimaud, centred on a network of canals. Travel around the beautiful outskirts of the town in your own luxury rental car and make the most of the ocean roads. Home to the biggest brands in the world of luxury shopping, Cannes is great for market browsing at Marché Forville and people watching on the Croisette. Cannes is also well located for fishing fanatics who can drive to Lac St Cassien, just 25 minutes from Cannes for carp fishing. Or, take a detour to the ‘Capital of Perfume’, Grasse, for a workshop to create your own scent and a nosey around the International Museum of Perfumery. With a handful of sandy beaches and plenty of restaurants, Antibes can fill up any itinerary. Visit the Picasso Museum or Archaeology Museum (both located on the Old Town remparts), grab an ice cream from a gelateria or sit with ‘un café’ beside the town fountains and watch the world go by.